Type: BOOKS. Detail: McDonald, N. Product Code: 9781857446227. 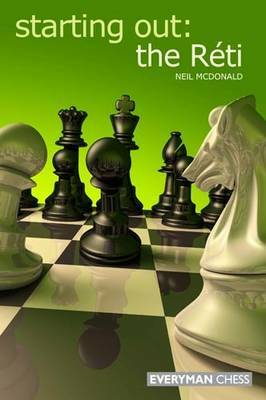 Starting Out: Play The Reti by Neil McDonald is focused almost exclusively on the sequence 1.Nf3 d5 2.c4, which is identified with the great Richard Reti who did much to promote it through his games and writings. Like other works in the Starting Out series, Play The Rti is structured around 55 annotated model games, almost all played the last decade. These games will likely reveal some surprises to nonRti specialists as the traditional main line 1.Nf3 d5 2.c4 d4 3.e3 is now thought to give nothing (3.g3 being a better choice) while after 1.Nf3 d5 2.c4 dxc4 objectively speaking White has nothing better than 3.e3 transposing into a Queens Gambit Accepted. McDonald explains why this is so and also has interesting analysis on 1.Nf3 d5 2.c4 c6 3.g3 Nf6 4.Bg2 dxc4 5.00 an unclear gambit that also arises from the moveorder 1.Nf3 d5 2.g3 Nf6 3.Bg2 c6 4.c4 dxc4. The last chapter on the English, approximately 30 pages, is a sort of a grab bag that tries to offer the reader ideas on how to meet nonRti lines after 1.Nf3. Here older books on the Rti by Davies and Dunnington might be useful to consult as this is a lot of material to cover in not so many pages. Contents: Introduction 1 Black Seizes Space: (1.Nf3 d5 2.c4 d4) 2 The Rti Slav: Introduction and the New York System (1.Nf3 d5 2.c4 c6 3.g3 Nf6 4.Bg2 Bf5) 3 The Rti Slav: Capablancas System (1.Nf3 d5 2.c4 c6 3.g3 Nf6 4.Bg2 Bg4) 4 The Rti Slav: Black Plays dxc4 (1.Nf3 d5 2.c4 c6 3.g3 Nf6 4.Bg2 dxc4) 5 The Open Rti (1.Nf3 d5 2.c4 dxc4) 6 The Closed Rti (1.Nf3 d5 2.c4 e6 3.g3) 7 Ideas in the English Opening. Review by John Donaldson.